The first day of spring was last week, which means it is time to start thinking about spring cleaning. However, when it comes to cleaning, people often just clean for appearance, cleaning only to the point where dirt and grime is no longer seen. But, other, less visible surfaces that can be attracting a lot of dust and germs are neglected. Below are four areas that get overlooked by many, but still require cleaning. Just because a surface is too high to see doesn’t mean it is clean. Places such as ceiling fans, light fixtures, above window sills and doors need just as much attention as other surfaces. Ceiling fans attract a lot of the dirt and germs that are floating in the air. When the fans are turned on, allergens are dispersed throughout the room, to be inhaled by the occupants. Light fixtures can attract a lot of dust as well, and it factors into how well-lit a room is. A dusty, dirty light fixture will release 30% less light than a cleaned-off, dust-free fixture. Adding cleaning light fixtures to your weekly cleaning routine will make a very noticeable difference in any room. The top of window sills and doors are non-visible surfaces that rarely get cleaned. If you are wanting to have a dust-free and dirt-free environment, don’t disregard the top of those surfaces just because you can’t see them. Like the fans, the dirt can be dispersed throughout the room with the opening and closing of the doors and windows. The High Duster Kit, as well as the Cleano, utilize microfiber along with extensions, making these high surfaces a lot simpler to clean, without having to climb up onto stools or furniture in order to reach. The microfiber removes 99% of the dust from the surfaces being cleaned as it uses electrostatic charges and microscopic fibers – 10x finer than the human hair – to capture the germs instead transferring them from one surface to another. With adding high surfaces to your spring cleaning checklist, it can be a safe assumption that low surfaces, though not entirely visible, need the same attention. Floors are almost always one of the top priorities when it comes to cleaning, but baseboards, on the other hand, are often forgotten. Cleaning baseboards can be a fairly simple task, as long as they are being regularly maintained. However, if you continue to neglect them, the dirt can start to accumulate and build-up, making a once simple task into a difficult, time-consuming project. 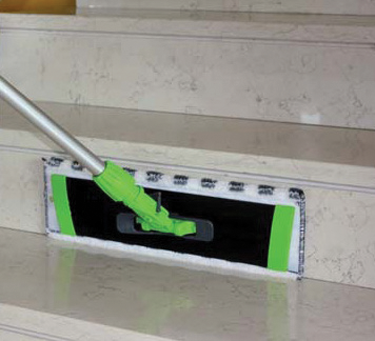 IPC Eagle has a line of microfiber mops as well as mop frames that can help clean baseboards efficiently and effectively. The Slide Frame, for example, uses a central joint that allows the handle to slide and reach all angles. That frame, coupled with a microfiber mop or pad, makes cleaning baseboards a lot easier, as well as faster than using cleaning spray and a cloth. The surfaces that are touched the most don’t always correspond with the surfaces that are cleaned the most. Items such as handles and door knobs, phones and remotes come into contact with many people, which should make them a priority on your cleaning list. 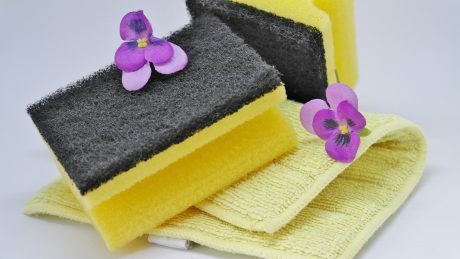 Microfiber cloths are perfect for these cleaning jobs. As mentioned before, the innovative cloth can capture the dust with their electrostatic charge and microscopic fibers, which makes an easy wipe-down of these surfaces enough to remove the germs. Because it is a fast process, it can be possible stay on top of cleaning these surfaces, preventing the spreading of germs from one area to the next. Walls are some of the largest surfaces in rooms, but they aren’t on many cleaning checklists. They collect fingerprints, dust, dirt and grime, but because they are such a daunting cleaning task, it is easier to want to pass on cleaning them. However, using a product such as the Cleano, makes cleaning walls much easier. The Cleano can cover a greater deal of surface than cleaning with a cloth (2x faster) and and when using poles, they can reach a lot farther. With that, the moving and climbing on of furniture is no longer necessary, as you can just extend the Cleano out to reach the surface. You would be surprised at how much cleaner a room can look after the cleaning of walls, making it an ideal item to add to your cleaning checklist. Click here to contact IPC Eagle and see which cleaning products are available to help you with your spring cleaning.